Lifeline® Normal Human Peripheral Blood Mononuclear Cells (HPBMC) provide an ideal culture model for the study of inflammation and immunity. HPBMC consist of several cell types including T cells, B cells, and monocytes. Lifeline® HPBMC are cryopreserved immediately after isolation from collection via leukapheresis to ensure optimal function and the highest viability. 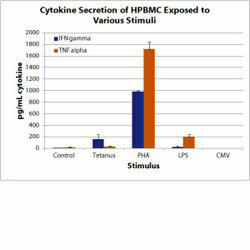 Our HPBMC are quality tested for viability and cytokine production. Age, gender and race of the donor are provided. Top: The graph shows release of interferon gamma and tumor necrosis factor alpha from HPBMC exposed to tetanus toxoid, phytohemagglutinin, E. coli lippopolysaccharide, and cytomegalovirus antigens. Lifeline Cell Technology provides products using the highest quality raw materials that incorporate extensive quality assurance in every production run. Exacting standards and production procedures ensure consistent performance.